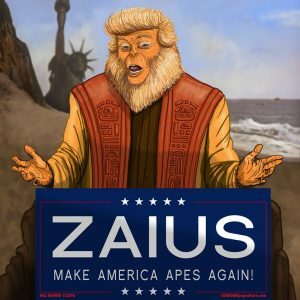 11/15/18 News of Planet of The Apes, with Meria. Calif fires; 56 dead; Whitaker investigation; Blue wave; trump goes nuts; recounts; weed killer in water; PG & E cause of fire? Saudi’s and Khashoggi; Avenatti; Mueller; DeVos; Britain; $6 trillion wasted on war on terror; troops wasted on border; Midterms and Israel; QAnon implodes; Ocasio-Cortez; trumps tax returns; Maxine Waters; CNN & Fox on Acosta; who’s next to get the axe? Melania thinks she’s queen; fans attack Fox; Roger Stone & Corsi; Zuckerberg vs. the world; Tax cuts did nothing; hate crime up 17% under trump; resignations in Israel; trump gets an “F” on his presidency; Senator Williams arrested; Ted Olson; UFO’s off Irish coast; white cop shoots black security guard; Amazon; N.Korea’s secret missile bases; Rick Scott; new comet; Rachelle Shannon on the loose; and more insanity. 3 Responses to "News of Planet of the Apes, with Meria"
without humor I don’t know how we could stand it. Somebody said that “the Universe is indifferent to your suffering.” Doesn’t that describe Trump? He, quite literally, has no empathy (even FAKE empathy) for any other human.